Poster presentations line Milton Atrium in the Life Sciences Complex. “The conference was invaluable for facilitating research collaborations, building community, and exposing students to areas of research outside their home labs,” says Katharine Lewis, associate professor of biology, and one of the organizers of the inaugural CNY Zebrafish Conference. Joining Lewis in organizing the conference were Jeff Amack, associate professor of cell and developmental biology at SUNY Upstate Medical University, and Jason Meyers, associate professor of biology and neuroscience at Colgate University. The April 22 conference drew participants from 15 different institutions, representing nearly 20 individual laboratories, Lewis says. The day was a mix of student and faculty talks, poster presentations and opportunities for socialization. “I was so impressed with the turn out. Both the number of scientists and the number of different institutions represented at the conference exceeded my expectations,” Amack says. The diversity of zebrafish research topics presented demonstrates the importance of this little aquarium fish in understanding vertebrate development. Talks covered development of the inner ear, brain and spinal cord. Presentations also delved into the topic of how the body designates a right versus left side during development and the phenomenon of retinal regeneration. 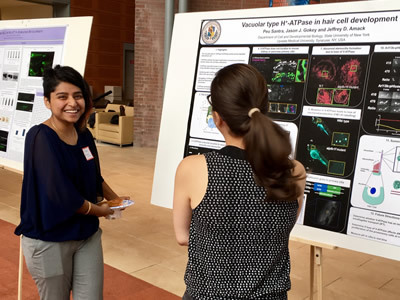 “The conference was excellent for graduate and undergraduate students to get experience the diversity of research that occurs on zebrafish,” Meyers says. In addition to intellectual stimulation, participants swapped best practices on caring for zebrafish and new technologies, including a seminar by Samantha England, research assistant professor, on the hot new gene editing tool known as CRISPR. Unlike many conferences, the CNY Zebrafish Conference was free to attend, thanks to sponsorship from research technology companies LPS, Carl Zeiss Microscopy, Krackeler Scientific and NIGHTSEA. This unique opportunity meant more students, including undergraduates, could afford to attend. Indeed, Lewis reports that half of the attendees were students. Although it’s too soon to point to specific collaborations resulting from the CNY Zebrafish Conference, Lewis notes that a number of new project ideas developed from the gathering. And Lewis is just getting started: she plans to make the conference an annual event. “Continuing the conference will help zebrafish researchers across this region be even more successful by widening their network, interacting with potential collaborators, giving student feedback on their research, and building community.” Lewis says. “I am thrilled to be a part of this new community. My hope is that we can attract even more local scientists to attend future meetings,” says Amack.